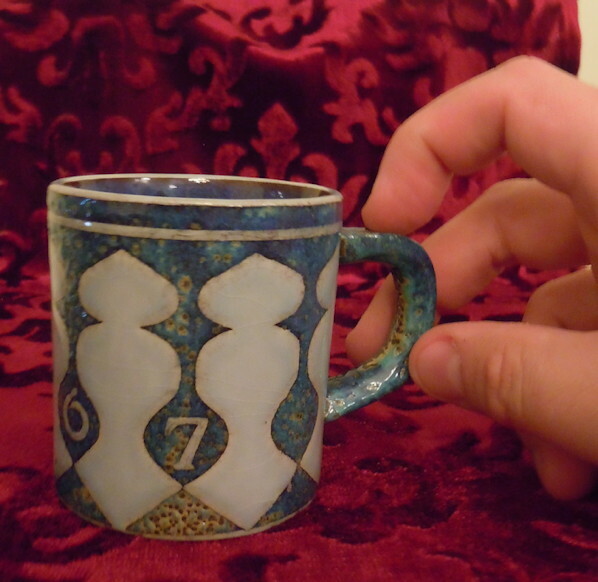 The next set of items I brought back from my east coast trips are ten small faience mugs, manufactured by Royal Copenhagen. As far as I can tell, the company has released a new mug by a different designer each year starting in 1967, and I came back with 10 of the 12 mugs from the years 1967 to 1978. Despite that, I really liked the designs – especially the later ones – and decided to take them. I think my sister thought I was a bit odd for getting attached to them. The 1967 one seems not to be in good shape – you can see some discoloration in the picture above – and 1972 (below) shows a similar problem. But all of these have just been sitting in a simple built-in china cabinet for decades, so I’m not surprised they’re not pristine. As you can see, I’m missing 1970 and 1974. I wonder whether Mom didn’t buy those, or if they got broken or misplaced somewhere along the way. Honestly I never paid much attention to her china cabinet (I’m sure when I was a kid she told me to stay away from it), so I don’t know. Mom doesn’t seem to know either. It looks like the earlier mugs, at least, were limited editions. The later ones I can’t tell.